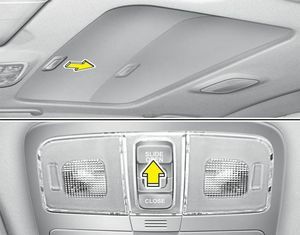 To open the sunroof (autoslide feature), press the slide button (1) on the overhead console (for more than 0.5 seconds). The sunroof will slide all the way open.To stop the sunroof sliding at any point, press any sunroof control button. To close the sunroof (autoslide feature), press the close button (3) on the overhead console (for more than 0.5 seconds). The sunroof will slide all the way close.To stop the sunroof sliding at any point, press any sunroof control button.